It was the successor of the Hungarian Democratic Republic and lasted only from 21 March to 1 August 1919. 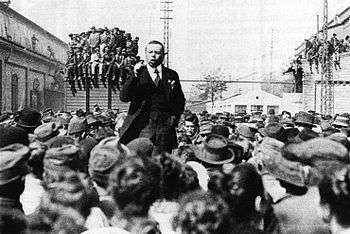 The state was led by Béla Kun and was not recognized by France, the UK or the US. It was the second socialist state in the world to be formed after the October Revolution in Russia brought the Bolsheviks to power. De facto, the Hungarian Soviet Republic didn't have an independent foreign policy; it had to follow and fulfill the commands, instructions and interests of the Kremlin. The Hungarian Republic of Councils had military conflicts with the Kingdom of Romania, the Kingdom of Serbs, Croats and Slovenes and the evolving Czechoslovakia. It collapsed on 1 August 1919 when Hungarians sent representatives to negotiate their surrender to the Romanian forces. An initial nucleus of a Hungarian communist party had been organized in a Moscow hotel on 4 November 1918, when a group of Hungarian prisoners of war and other communist proponents formed a Central Committee. 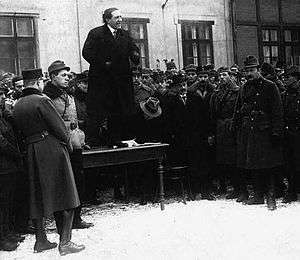 Led by Béla Kun, the first members returned to Hungary, and on 24 November created the The Party of Communists from Hungary. The Communist party chose "The Party of Communists from Hungary" (Hungarian: Kommunisták Magyarországi Pártja) title instead of "Hungarian Communist Party", because — at the time — the vast majority of their following represented social class: the factory workers, the "proletariat," hadn't ethnic Hungarian roots in Hungary yet, and the ethnic Hungarians were only a minority in the newly founded party. It recruited members while propagating party's ideas, radicalising many Social Democrats in the process. By February 1919, the party numbered 30,000 to 40,000 members, including many unemployed ex-soldiers, young intellectuals and ethnic minorities. The Communists came to power as the only group with an organised fighting force, promising Hungary would be able to defend its territory without conscription. (Kun falsely promised the military help and intervention of the Soviet Red Army against Romanian, Czechoslovak and French - Yugoslav - forces, none of whom were communist at that time). Kun founded a newspaper, called Vörös Újság ("Red News") and concentrated on attacking Károlyi's liberal government. During the following months, the Communist Party's power-base rapidly expanded. Their supporters began to stage aggressive demonstrations against the media. In one crucial incident, a demonstration turned violent on 20 February and the protesters attacked the editorial office of the Social Democrats' official paper, called Népszava (People's Word). In the ensuing chaos, seven people—including policemen—were killed. The government arrested the leaders of the Communist party, banned Vörös Újság and closed down the party's buildings. The arrests were particularly violent, with police officers openly beating the communists. This resulted in a wave of public sympathy for the Communist Party. On 1 March, Vörös Újság was given permission to publish again, and the Communist Party's premises were re-opened. The leaders were permitted to receive guests in their prison, which allowed them to keep up with political affairs. On 20 March, Károlyi announced that the Dénes Berinkey government would resign. Mihály Károlyi resigned and he was arrested by the new communist regime, he could only manage to escape and flee to Paris only after the end of July 1919. On 21 March, he informed the Council of Ministers that only the Social Democrats could form a new government, as they were the party with the highest public support. 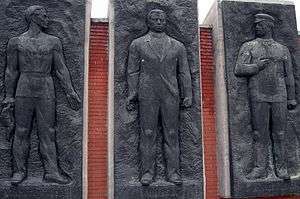 In order to form a governing coalition, the Social Democrats started negotiations with the Communist leaders—who were still imprisoned—and decided to merge their two parties under the name of Hungarian Socialist Party. Béla Kun and his communist friends were released from the Margit Ring prison on the night of 20 March, 1919. For the Social Democrats, an alliance with the KMP not only increased their standing with the common people, but also gave them a potential link to the increasingly powerful Russian Communist Party, as Kun had ties with prominent Russian Bolsheviks. President Károlyi, who was an outspoken anti-Communist, was not informed about the fusion of the parties. Thus, while believing to have appointed a social democratic government, he found himself faced with one dominated by Communists. 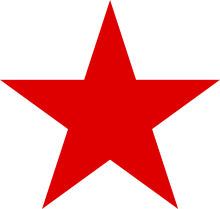 Following Lenin's model, but without the direct participation of the workers' councils (soviets) from which it took its name, the newly united Socialist Party created a government called the Revolutionary Governing Council, which proclaimed the Hungarian Soviet Republic and dismissed President Károlyi on 21 March. This government consisted of a coalition of socialists and communists, but with the exception of Kun, all commissars were former social democrats. The government was led by Sándor Garbai, but Kun, as Commissar of Foreign Affairs, held the real power. Under Kun, the new government, which had adopted in full the program of the Communists, decreed the abolition of aristocratic titles and privileges; the separation of church and state; codified freedom of speech and assembly; and implemented free education, language, and cultural rights to minorities. The Communist government also nationalized industrial and commercial enterprises, and socialized housing, transport, banking, medicine, cultural institutions, and all landholdings of more than 40 hectares. These economic policies created high inflation while leading to food shortages across the land. Public support for Communists was also heavily dependent on their promise of restoring Hungary's former borders. The government took steps toward normalizing foreign relations with the Triple Entente powers in an effort to gain back some of the land that Hungary was set to lose in the post-war negotiations. In late May, after the Entente military representative demanded more territorial concessions from Hungary, Kun attempted to "fulfill" his promise to restore Hungary's borders. At some point in June, the Hungarian Red Army invaded the eastern part of the newly-forming Czechoslovak state (today's Slovakia), the former so-called "Upper Hungary". The Hungarian Red Army achieved some military successes: under the lead of Colonel Aurél Stromfeld, it ousted Czech troops from the north, and planned to march against the Romanian army in the east. 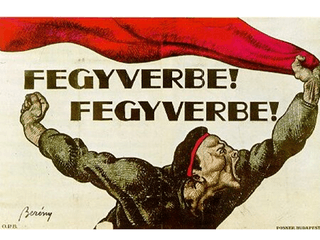 Despite the communist promises about the restoration of the former borders of Hungary, the communist declared the establishment of the Slovak Soviet Republic in Prešov on 16 June 1919. After the proclaiming of the Slovak Soviet Republic, the Hungarian nationalist and patriots soon realized that the new communist government had not any intentions to recapture the lost territories, and their only real intention is the spreading of communist ideology and the establishment of communist states in Europe, thus they even sacrifice the Hungarian national interests. Despite of the series military victories against the Czechoslovak army, the Hungarian Red Army started to disintegrating due to the foreign policy scandal (the establishing of the Independent Slovak Soviet Republic) of the communist government. This concession shook his popular support. These events detached the professional military officers, the patriots and nationalists in the Hungarian Red Army. Even Aurel Stromfeld, the military leader of the Red Army resigned. Kun withdrew his remained troops (who had remained loyal after the scandal), when the French promised the Hungarian government that Romanian forces would withdraw from the Tiszántúl. Following the Red Army's retreat from the north, the Romanian forces were not pulled back. Kun then unsuccessfully tried to turn the remained units of the demoralized Hungarian Red Army on the Romanians. The Hungarian Soviet found it increasingly difficult to fight Romania with the small volunteer force, and support for both the war and the Communist Party was waning at home. After the demoralizing retreat from Northern Hungary (later part of Czechoslovakia), only the most dedicated Communists having volunteered for combat. Romanian army broke through the weak lines of the Red Army on 30 July. Béla Kun, together with other high-ranking Communists, fled to Austria on 1 August with only a minority, including György Lukács, the former Commissar for Culture and noted Marxist philosopher, remaining to organise an underground Communist Party. The Budapest Workers' Soviet elected a new government, headed by Gyula Peidl, which only lasted a few days before Romanian forces entered Budapest on 6 August. ↑ Angyal, Pál (1927). "A magyar büntetőjog kézikönyve IV. rész". A magyar büntetőjog kézikönyve. Retrieved 19 January 2012. ↑ Spencer C. Tucker (2014). World War I: The Definitive Encyclopedia and Document Collection [5 volumes]: The Definitive Encyclopedia and Document Collection. ABC-CLIO. p. 867. ISBN 9781851099658. ↑ Howard Morley Sachar (2007). Dreamland: Europeans and Jews in the Aftermath of the Great War. Knopf Doubleday Publishing Group. p. 409. ISBN 9780307425676. ↑ Kodolányi, János (1979) . Süllyedő világ (in Hungarian). Budapest: Magvető. ISBN 978-963-270-935-2. OCLC 7627920. ↑ Jack A. Goldstone (2015). The Encyclopedia of Political Revolutions. Routledge. p. 227. ISBN 9781135937584. ↑ Peter Pastor (1988). Revolutions and Interventions in Hungary and Its Neighbor States, 1918-1919, Volume 20. Social Science Monographs. p. 441. ISBN 9780880331371. ↑ "Magyar Tudomány 2000. január". Epa.niif.hu. Retrieved 2008-11-21. ↑ "Hungary: Hungarian Soviet Republic". Library of Congress Country Studies. September 1989. Republished at geographic.com. Retrieved 7 October 2010. ↑ ""White Terror" in Hungary 1919-1921". Armed Conflict Events Database. 16 December 2000. Retrieved 7 October 2010. ↑ 2000 - BŰN ÉS BŰNHŐDÉS Archived 30 May 2007 at the Wayback Machine.